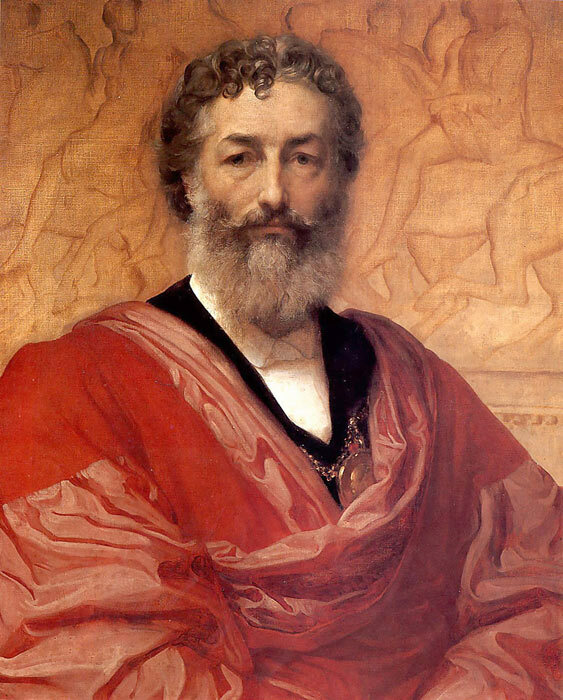 Leighton's serf-consciously distinguished Self-Portrait of 1880 was commissioned by the Uffizi Gallery in Florence for its historic collection of artists' self-portraits. The combination of the chain and medal of office of the president of the Royal Academy, the gown of an Oxford Doctor of Common Law, the fragment of the Parthenon frieze in the background, and the carefully arranged curls on his brow all confirm the impression of an official portrait. Indeed, this rather stilted painting recalls the cutting words of the writer Vernon Lee, who, on a visit to Leighton in his house in 1883 characterized him as a mixture of "Olympian Jove and a Head Waiter," both a superb decorator and a superb piece of decoration. SPECIAL NOTE : The painter will make the reproduction as close to the original oil painting as possible. If you want your painting to alter from this likeness, please email us and " Self-portrait, 1880 " will be reproduced according to your special requirements.